This Incident Report describes how the Tatmadaw Southern Command Headquarters, Light Infantry Battalion (LIB) #351, also known as the Tha Bo Battalion, shot and killed a S--- villager's three buffalos in March 2018 when fighting broke out between the Tatmadaw and Karen National Liberation Army (KNLA). The victim, Saw R---, reported this case to the village head, village tract leader and Karen National Union (KNU) leaders, but they could not resolve this case for him because the buffalos were killed by the Tatmadaw. The following Incident Report was written by a community member in Hpapun District who has been trained by KHRG to monitor local human rights conditions. It is presented below translated exactly as originally written, save for minor edits for clarity and security. This report was received in May 2018 along with other information from Hpapun District, including two other incident reports, 16 interviews, one situation update, and 177 photographs. When I [KHRG researcher] arrived at S--- village, local civilians reported that the Tatmadaw had shot and killed the buffaloes owned by Saw R---, a local villager. I met with the victim on April 14th 2018 to interview him about this incident. [A local villager], Saw R--- provided detailed information about the incident. In March 2018, fighting broke out several times between the Tatmadaw and Karen National Liberation Army [KNLA]. The Tatmadaw fired mortars into villagers' farms and roads [used by civilians]. During this skirmish, Tatmadaw shrapnel hit and killed a big female buffalo owned by Saw R---. In March 2018, displaced people did not feel that it was safe enough to return to S--- village to look after their animals because the Tatmadaw were based nearby. Their goats, chickens, and buffalos were roaming near their farms to find food to survive. 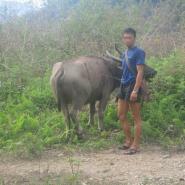 One night, Saw R---'s buffalos went near the Tatmadaw base. Tatmadaw soldiers shot and killed two buffalos. Local civilians received information from the Karen National Union (KNU) that the Tatmadaw reported that they killed the villagers' buffalos by accident. The Tatmadaw claimed that they thought the buffalos were the KNLA coming to attack them, so they fired on them. However, Saw R--- and other local civilians in Ler Mu Plaw believe that the Tatmadaw intentionally shot and killed his two buffalos. All buffalos wear a bamboo bell, which makes a sound whenever the buffalos move. [The villagers pointed out that] the KNLA do not wear bamboo bells, so the Tatmadaw must have targeted and killed the villager's buffalos on purpose. The Tatmadaw unit that patrols in the Ler Mu Plaw area is the Southern Command Headquarter LIB #351, also known as the Tha Bo Battalion. The compensation for the three buffalos killed by the Tatmadaw is more than 2, 400,000 kyats [US $1,751.83]. Saw R--- owned these three buffalos and he had looked after them for nearly seven years. If the Tatmadaw had not killed these three buffalos, one of the buffalos could have given birth to calves for Saw R---. The death of the buffalos will cause long-term difficulties for Saw R---’s livelihood. Saw R--- has not received any compensation from the Tatmadaw. He does not feel safe enough to go to the area where his buffalos were killed because the Tatmadaw is currently patrolling nearby. He reported this issue to the village head, village tract leader and KNU authorities, but they could not do anything for him because Tatmadaw soldiers were the perpetrators. Saw R--- is sad to have lost his buffalos. His family is currently hiding in the forest from the Tatmadaw, where they are facing health problems and difficulties securing enough food for their survival. The victim Saw R--- allowed us [KHRG] to use the information that he provided for publication.